Paymill is a payment processing software that enables users to accept mobile payments on the mobile app, SaaS, or e-commerce platforms. It’s a robust program that serves small e-commerce businesses looking to offer secure and professional credit card processing. The solution is designed to help merchants build checkouts that customers can use anytime, anywhere on their mobile devices. It utilizes easy, widespread integrations to deliver increased value, irresistible to merchants. The application facilitates smooth online payments for web-based merchants with simple, worry-free payments solutions. Paymill allows you to cast a wide net and reach as many customers as possible with over 100 currencies accessible to over 34 countries. It also adopts stringent security measures to ensure each data is encrypted to meet the highest security standards. Paymill offers a reliable set of features that enable merchants to fully customize the mobile checkout process. The solution opens exciting, international payment gateway to grow business and accept payments from around the globe. Straight from the get-go, Paymill will equip you with the tools to reach the global market and accept payments in over 100 different currencies. Merchants will also marvel at the available payments methods. Whether its Visa, MasterCard, Visa Electron, or Maestro, you will accept all payments with unprecedented ease and simplicity. 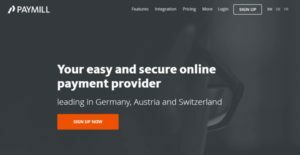 The solution makes it easy to set up different purchasing methods on your website to facilitate faster and convenient payment. The freedom to customize your checkout gives you the power to optimize your processes to higher conversions. Paymill comes with proven safety measures; everything you need to safeguard your business and instill confidence in your customers is already built-in. The software is PCI DSS-compliant meaning you will meet the standard security levels when processing, transmitting and storing customer’s card information. In addition, merchants can rest easy thanks to the advanced fraud prevention and monitoring tools used. Also, the 3-D secure feature certifies the security of your checkout process by ensuring the customer is the actual cardholder. This helps you tame chargebacks while offering optimal protection to every successfully verified transaction. All these security features coupled with SSL, HTTPS, and 256bit encryption ensure you remain secure and compliant for all the payments. The integrated payment analytics tools allow you to view all transaction in a centralized place. The tools empower you to accurately refund clients and easily monitor revenue growth with just a few click of the mouse. If you are interested in Paymill it might also be sensible to check out other subcategories of Best Mobile Payment Systems listed in our database of B2B software reviews. It's crucial to realize that virtually no service in the Mobile Payment Systems category will be a perfect solution able to meet all the needs of various company types, sizes and industries. It may be a good idea to read a few Paymill reviews first as some services can perform well just in a really small set of applications or be designed with a very specific type of industry in mind. Others might operate with an intention of being easy and intuitive and therefore lack complex functions needed by more experienced users. You can also come across apps that focus on a large group of customers and give you a rich feature toolbox, however that in most cases comes at a more expensive cost of such a service. Be certain that you're aware of your needs so that you select a solution that offers specifically the functionalities you search for. How Much Does Paymill Cost? We realize that when you make a decision to buy Mobile Payment Systems it’s important not only to see how experts evaluate it in their reviews, but also to find out if the real people and companies that buy it are actually satisfied with the product. That’s why we’ve created our behavior-based Customer Satisfaction Algorithm™ that gathers customer reviews, comments and Paymill reviews across a wide range of social media sites. The data is then presented in an easy to digest form showing how many people had positive and negative experience with Paymill. With that information at hand you should be equipped to make an informed buying decision that you won’t regret. What are Paymill pricing details? What integrations are available for Paymill? If you need more information about Paymill or you simply have a question let us know what you need and we’ll forward your request directly to the vendor.